A train died near Wachusett station and that has gummed everything up. Or as SMM put it around 7:40 a.m.: Read more. 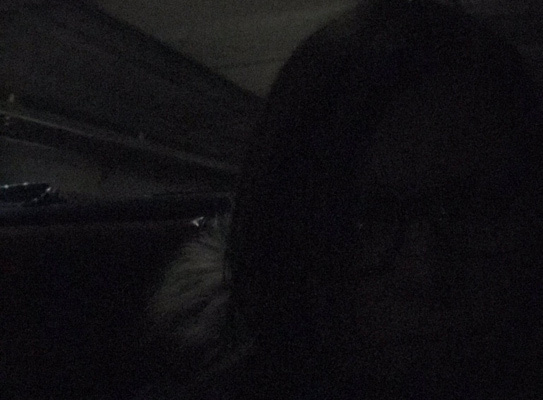 Passengers on an outbound Fitchburg Line train had to endure two hours on a cold, unlit train stuck in Weston this evening - and then 15 minutes standing outside in single-digit temperatures waiting for a relief train. Read more. Mark A. Grasso was heading into town on Train 414 on the Fitchburg Line, which pulled into Belmont shortly after noon - and then just sat there. He reports: Read more. Around 11:10 p.m. at the Old Sudbury Road crossing. Read more. A car on a Fitchburg Line train slipped off the rails - but stayed upright - outside the Waverly stop around 7:30 a.m. Riders were given the option of waiting for a relief train - which still hadn't come after an hour - or walking to the nearest station. Read more. 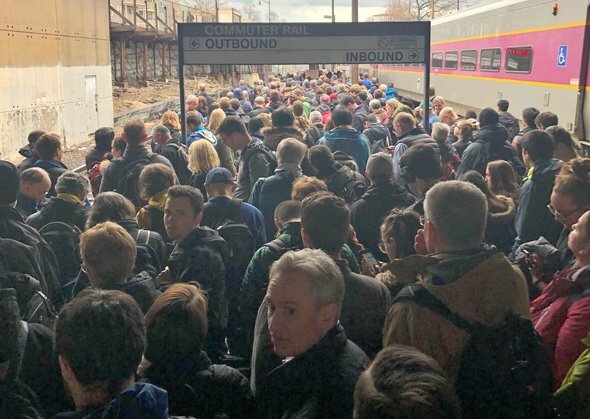 The 400 train was canceled and now the 402 train out of Fitchburg is running 45 minutes late, the MBTA reports. It is operating at reduced speed between Waltham and North Station due to a mechanical issue. Other lines reporting some delays, but no others like that. Keolis says its train engineers are now blowing their horns as they approach the Sherman Street crossing starting as early as 6:30 a.m. because it's decided the area is no longer a "quiet zone." A Cambridge city councilor who is also currently vice mayor responds: Wha? Read more. The Orange Line suffered delays due to signal problems at Oak Grove, while the Red Line slowed to a crawl because of a dead train at Davis earlier this morning. Meanwhile, over on commuter rail, a dead train is causing problems on the Fitchburg Line, which is not one of those coastal routes where that was supposed to happen. Transit Police report a 60-year-old man on the Fitchburg Line tracks near Fawcett Street in Cambridge was hit and killed by an inbound train around 12:15 p.m.
Foul play is not suspected, police say. This playa right here has me wanting to trade my snapbacks in and upgrade my hat collection. Transit Police report a woman, believed to be in her 20s, was fatally struck by a Fitchburg Line train around 6:30 a.m. near Washington Street. On Monday, a man was hit and killed by a Fitchburg Line train in Concord. Transit Police report a man on the inbound Fitchburg Line tracks near Park Street was hit and killed by a train around 12:20 p.m. Transit Police report arresting a pair of Concord teens on charges they concocted a pair of flash-fire devices, one of which went off near the Sudbury Road crossing on Fitchburg Line yesterday afternoon, starting a brush fire that halted commuter-rail service. Read more. Major delays on the Fitchburg Line again this morning, this time due to a car/train collision at Brighton Street in Belmont. NECN reports the car was stopped on the tracks and the driver was trying to get three children out when the train hit. we're supposed to be arriving in Boston now. Instead we're in Acton going in the *reverse direction*. They...they even drew a little sign around "Hastings" and gave the MBTA website and everything! So...this is the signage. THIS IS THE ONLY INDICATION THAT PEOPLE ARE WAITING AT THE HASTINGS COMMUTER RAIL STATION ON THE FITCHBURG LINE IN WESTON, MASSACHURSETSTES! HASTINGS? MORE LIKE HATE-STINGS, BECAUSE THIS STATION IS THE WORST! Transit Police report a male bicyclist, 25-30, rode around a crossing gate in the down position at Park Street in Somerville around 1:30 p.m. and was promptly struck and killed by an outbound Fitchburg Line train. Fitchburg Update: Train 1400 is operating 70-100 min late between South Acton & North Station at reduced speed due to a mechanical problem.